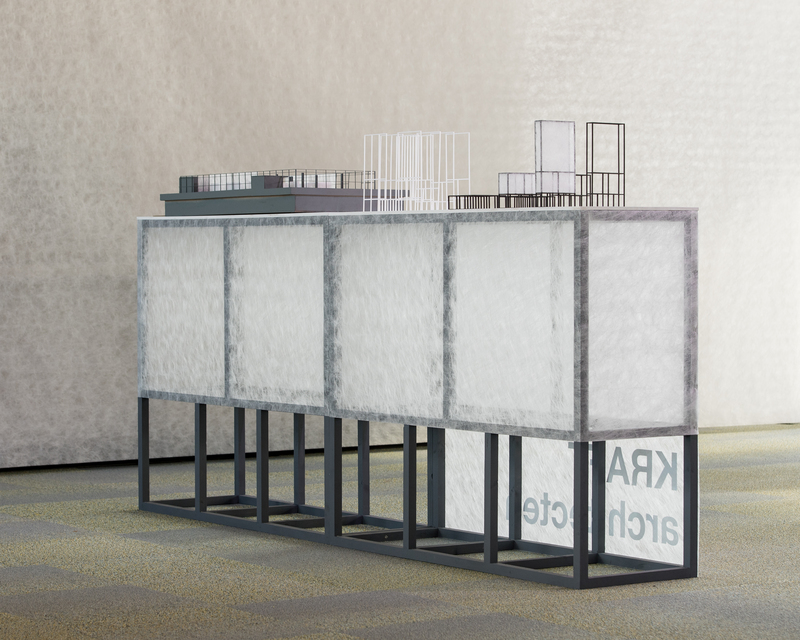 Last year, KRAFT architecten have designed a museum-like pavilion setting for In4nite at the Dutch Design Week 2017. They have been involved in establishing and shaping the In4nite research project from the very get-go. 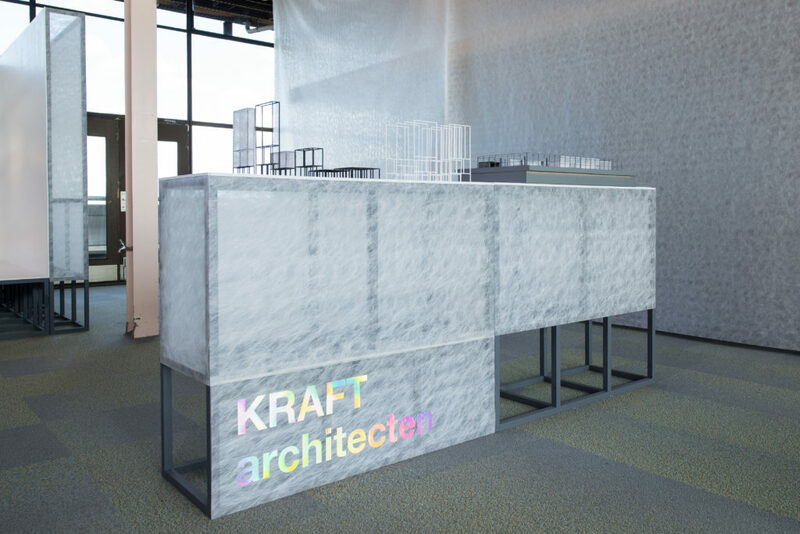 For the first as well as the second edition KRAFT architecten are partly responsible for the project management and the art direction plus they are in charge of the exhibition design.
" We want create something attractive and spectacular on the one hand, and wanting to provide the perfect conditions for each designer to showcase their work on the other hand." An introduction: who are you as a designer? And who are you in person? KRAFT Architecten is a young architecture studio, consisting of Joep Koenders (1980) and Arno Geesink (1980). We pride ourselves on a healthy dose of interest in the world, and creativity within our profession. Our shared opinion is that good buildings result from skilled design of both space and materials, but also from a well organised and pleasant design process. Our designs originate from a collaborative and investigative approach, a trajectory of close cooperation with our clients and advisors. Beautiful spaces that convey the right atmosphere and experience, combined with clear functionality and an excellent technical execution, sums up everything we adore. Although we are — to put it bluntly — professional nerds, next to our jobs we also enjoy visiting museums; travelling; literature; movies; and above all quality food and drinks. We cater to these needs by for example organising a yearly trip with a group of friends — mainly architects. Apart from discovering the local specialities, regular feasts are collectively concocted in the kitchen during these trips. How did you come to choose this profession? And for how long have you been working as a designer? Is there anything you specialise in? We have been actively working as architects for about eight to ten years. Already early on, Joep found his calling as an architect, whereas Arno had been brought up with a love for the trade. Our favourite projects often involve a sensitive context that might ask for a little extra attention; cultural heritage, or rural areas, for example. However, we’re generally interested in any assignment that contains some level of complexity. Adjusting somebody’s home to their way of living and being, for instance. We met at the Technical University of Delft, within the engineering department. Already back then, there were tentative whispers of potentially beginning a studio together in the future. After having acquired several years of experience working in tenured positions, Arno noticed a preference for projects that related more closely to his interests content-wise, as well as allowing for a closer collaboration with the clients. He found that these assignments generated more reciprocal energy. From this perspective, he founded KRAFT Architecten 2013. Joep became partner of the company in 2016, after having worked for several architecture firms in Berlin and Dublin, among places. How did you discover In4nite? 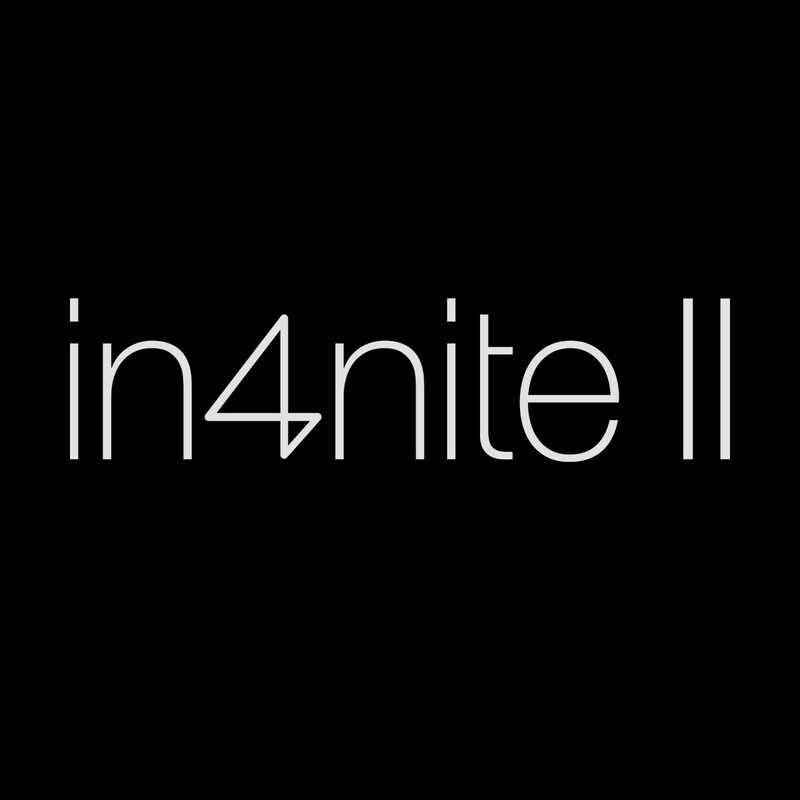 We have been involved in establishing and shaping the In4nite research project from the very get-go. For the first as well as the second edition we are partly responsible for the project management plus the art direction. You could say that this project was bound to happen due to the location of our studio, which is situated within a building full of other designers in the industrial park Kleefse Waard. Interdisciplinary exchange and innovative collaboration is fostered within the enormous manufacturing industry in which we find ourselves. Secretly, this is exactly what we hoped for when we set up shop at IPKW. Low & Bonar’s intrinsic motivation of wanting to change the mind-set of the company by investing in innovative and moreover attractive design solutions renders this an exciting project to be a part of. Do you collaborate with companies more often? If so, in what ways? And what was your/the studio’s role within the collaboration? An increasing amount of our work happens ‘business to business,’ within the traditional relation between client and architect. This project offers us the chance to structure it in such a way that it maximises results both for the designers as well as for a large international company such as Low & Bonar. Achieving this requires us to consider a great variety of things, from clearly defining the guiding principles and final goals for the project, to formulating the briefing for the designers. With what kind of materials do you enjoy to work? We prefer to work with reusable, local materials that are recognisable and legible, and contain a distinct tectonic quality; for example, wood and brick — visible constructions. Naturally, sustainability, recyclability, and the origin of the materials are important points of attention within our work. Prior to this project, we haven’t worked much with non-wovens, unless applied as semi-finished products in building materials. In these applications however, the material itself is never visibly present, merely serving the purpose of reinforcement, or as medium for another material. The In4nite project challenges its participants to reassess the non-woven material as a primary material for design and craft. We are rather charmed by the qualities of the material; it possesses properties that can make other materials stronger, lighter and overall better. Efficiency in how we consume the raw materials that are available follows as a direct consequence. As a primary building material, Colback has several surprisingly aesthetic qualities, such as translucence and a distinct texture. Additionally, it’s also easy to print on Colback. Its lightweight properties enable the rapid construction of large structures on location. Where lies the challenge for you in this project? How will you approach that? As we are responsible for the design of the stand at Dutch Design Week, we find ourselves caught between wanting to create something attractive and spectacular on the one hand, and wanting to provide the perfect conditions for each designer to showcase their work on the other hand. We wish to avoid taking up too much of the spotlight, and yet realise an inspiring background whilst optimizing our use of the materials at hand. When you begin a design process, what does that look like for you? Do you make sketches; deliberate; or engage in theoretical research? Please tell us more. Thanks to the success of last year’s edition, it has become much easier to approach Low & Bonar’s technical staff for material experiments, advice and information, as well as connecting with Low & Bonar’s partners. We have noticed that the designers are more readily paired with valuable actors within the field, and have access to a broader range of the company’s activities. Having formulated clearer goals for this year’s edition, we’re hopeful that the project will bear even more fruits for Low & Bonar; whether these be innovative production techniques; access to new market segments; or enticing designs that appeal to a growing public. Receiving support from Low & Bonar to present work alongside other designers — of whom many are our neighbours at IPKW — at a high-profile event such as Dutch Design Week, is incredibly inspiring. We find a lot of gratification in the experience of engaging in an intense collaboration with fellow designers on the one hand, and a multinational on the other hand. At the same time, by partially fulfilling a more advisory role as project managers, our studio is granted the opportunity to present ourselves as ‘design thinkers’ besides our profession as designers.